Bourgogne-Franche-Comté (meaning Burgundy–Free County) is one of the administrative regions of France. It is in eastern France and was formed in 2016 from two old regions: Bourgogne and Franche-Comté. The Bourgogne-Franche-Comté region is the sixth largest region of France with an area of 47,783.3 km2 (18,449 sq mi). It is in northeastern France and borders to the north with the Grand Est region, to the west with Île-de-France and Centre-Val de Loire regions, to the south with the Auvergne-Rhône-Alpes region, and to the east with Switzerland (the cantons of Vaud, Neuchâtel and Jura). Nice, 694 km (431 mi). The Vosges Mountains are in the northeast of the region and its highest point in Bourgogne-Franche-Comté is Ballon de Servance, 1,216 m (3,990 ft) high. The Jura Mountains are along the eastern limits; here is Crêt Pela, the highest point in Bourgogne-Franche-Comté with 1,495 m (4,905 ft). The Morvan mountains are in the centre of the western part; it highest point is Haut-Folin, 901 m (2,956 ft) high. The Crêt Pela (46°24′50″N 6°1′19″E﻿ / ﻿46.41389°N 6.02194°E﻿ / 46.41389; 6.02194﻿ (Crêt Pela)), at 1,495 m (4,905 ft), is the highest mountain of the Bourgogne-Franche-Comté region. It is in the Jura mountain range. The Bourgogne-Franche-Comté region had, in 2014, a population of 2,820,623, for a population density of 59.0 inhabitants/km2. 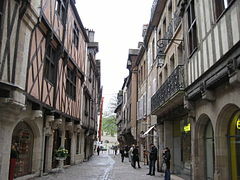 The department with more people living in it is Saône-et-Loire with 555,788 inhabitants. After the Territoire de Belfort, the smallest department in the region, Doubs is the department with highest population density (102 inhabitants/km2). The density in the other departments is lower. The old city of Besançon in the oxbow of the Doubs river. ↑ 1.0 1.1 "Région de Bourgogne-Franche-Comté (27)". Comparateur de territoire (in French). Institut national de la statistique et des études économiques - INSEE. Retrieved 23 June 2017. ↑ 2.0 2.1 "Populations légales 2014: Recensement de la population - Population des régions" (in French). Institut national de la statistique et des études économiques - INSEE. Retrieved 23 June 2017. ↑ "Liste des élus par commission" (in French). Region Nouvelle-Aquitaine. Retrieved 23 June 2017. ↑ "Ville de Besançon". Annuaire-Mairie.fr (in French). Retrieved 13 June 2018. ↑ "France Department High Points". Peakbagger.com. Retrieved 23 June 2017. Wikimedia Commons has media related to Bourgogne-Franche-Comté. This page was last changed on 13 June 2018, at 21:03.